A million events happen around us every day—some imperceptible (the movement of atoms), some incomprehensibly large (a witnessed car accident, a family choosing produce in the grocery store)—yet, in familiarity, they become dulled. They lose focus. We walk through our day unable to see, and therefore question, a holistic picture of the world as we are occupying it, moment by moment. 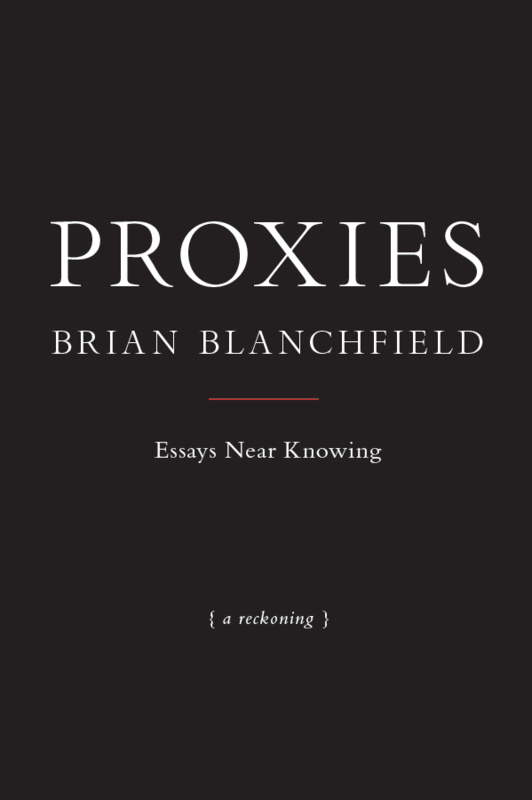 It is therefore hard to numerate the seemingly miraculous moments in Proxies in which Brian Blanchfield does exactly that. He doesn’t verbatim, translate the world around him; rather, he seeks the origin of the events, follows the train of thought around the events. He associates, and compares, and qualifies. The subtitle to the book, aptly named, is “Essays Near Knowing.” Not essays of expertise. Not even essays of critical analysis—essays in the proximity of understanding (bodily, mentally, philosophically). And near enough to knowing to also say, it is near to me, which is to say, I’m no expert. Your nearness of knowing may look different. In the essay, “On Propositionizing,” Blanchfield discusses the famous moment in which Helen Keller learned to communicate. Reflecting on her memoir, as well as accounts of the day she could spell w-a-t-e-r, Blanchfield utilizes poetic license to imagine Keller running home—picking up her doll, which she’d previously thrown to the ground in anger, having a complete and near epiphanical moment of knowing. She’d become associative, he states. She learned to connect the world around her, near to her. So too does he, in the same essay, when talking about his own relationship to the world. However, in doing so, Blanchfield releases his true craft—while he may be an extraordinary wordsmith and acute observer, his real talent, his distinctive talent, is in writing things slant. The reader is not looking straight on at an event or a narrative, but rather through several different shafts of light, like a prism of thoughtfulness. So many times while reading this, I thought about my students. About how to ask them these questions, which largely come around to the art and craft of writing/expressing oneself. Or really, the art of thinking. Or even, the art of association. The moment Helen Keller learned to spell her first word, she’d written in her memoir, was the moment she became a human person. And while I don’t believe that being verbal a human makes, I do think there’s merit in the question: when did you first get near to knowing?